California coast is incredibly amazing not only because of its wild coastline and ocean vistas, but also because of its rich marine life. It’s especially true about Monterey Bay in Central California. The Monterey Bay National Marine Sanctuary is the largest US marine sanctuary with a shoreline length of 276 miles (444 km) from just north of San Francisco’s Golden Gate Bridge to Cambria. 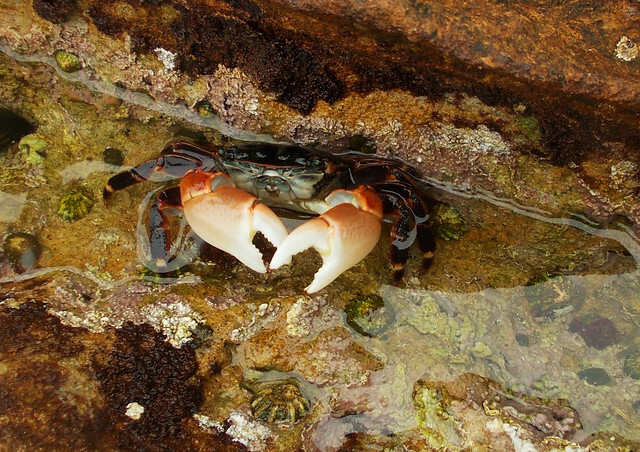 It has a unique and diverse marine ecosystem and it is home to 34 species of mammals. 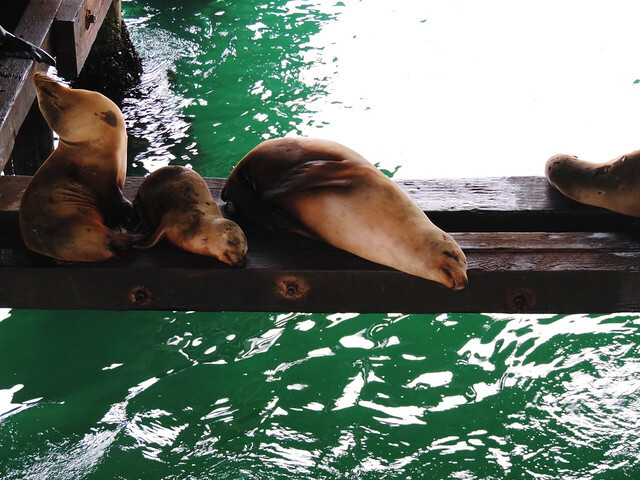 Actually, Monterey Bay is one of the best places in the US to observe whales, dolphins, killer whales and sea otters. 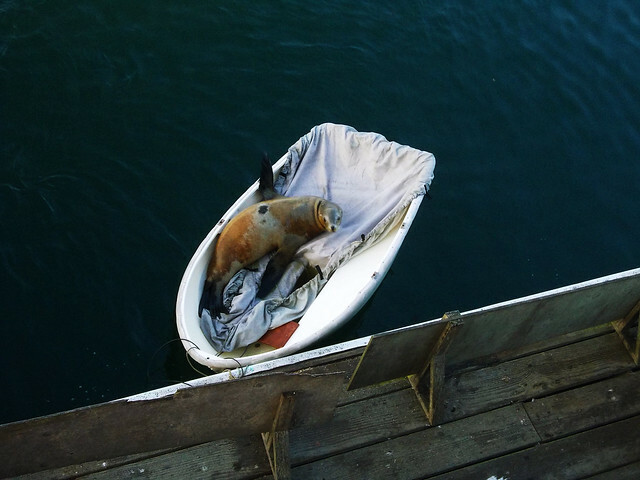 Of course, usually tons of seals and sea lions can be seen as well swimming and playing in the water or lying on the shore – or taking a nap in a boat in Monterey harbor. 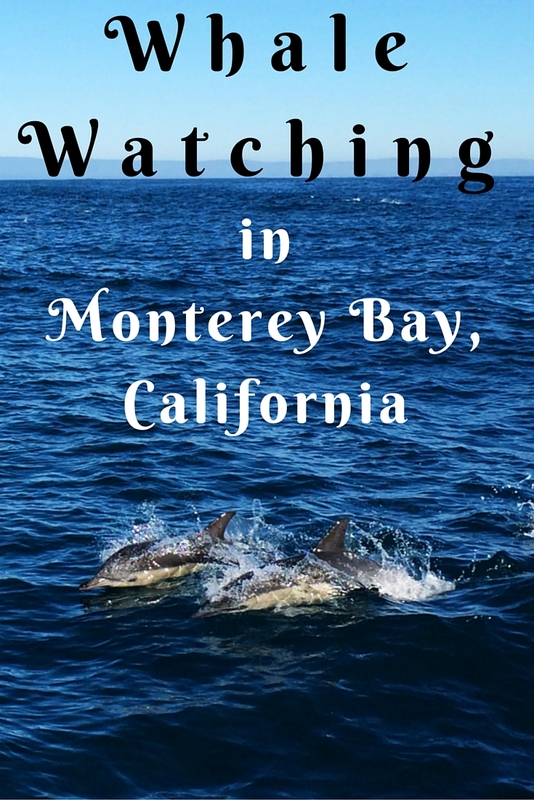 The other great thing at Monterey Bay is that you don’t necessarily have to take a whale watching trip to see whales and dolphins, because you can also see them from the shore very often. Binoculars will be your favorite thing here! 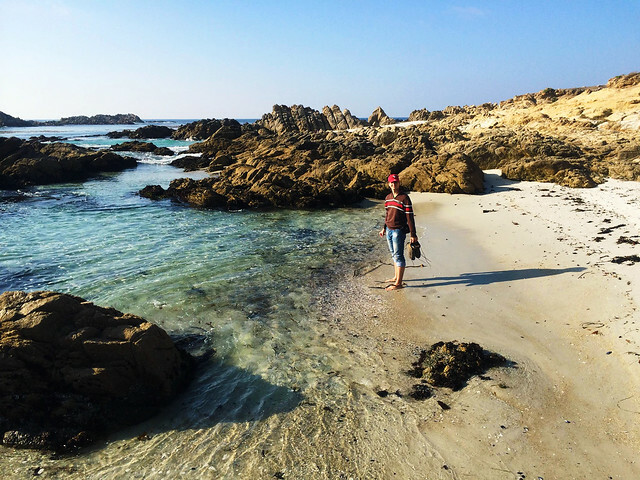 Whether you love hiking, roadtripping or taking a boat trip, all of these are great ways to enjoy what Monterey Bay can offer. 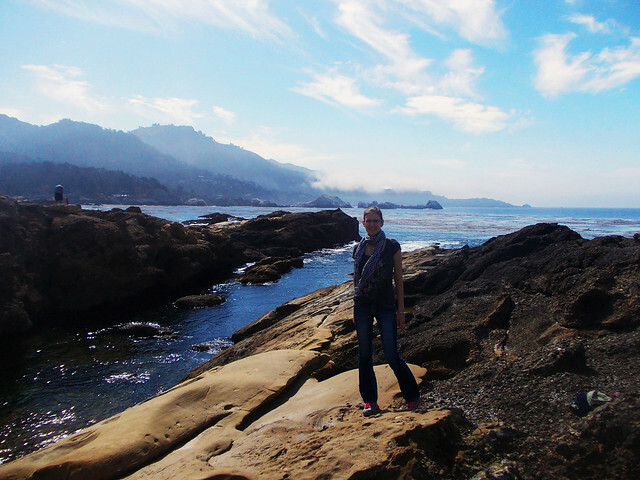 Point Lobos State Natural Reserve is a small coastal park just south of Monterey Bay and it offers great opportunities to observe wildlife. It has scenic views and charming little bays, too, but that’s true for a whole lot of other places – because, hey, it’s California coast. 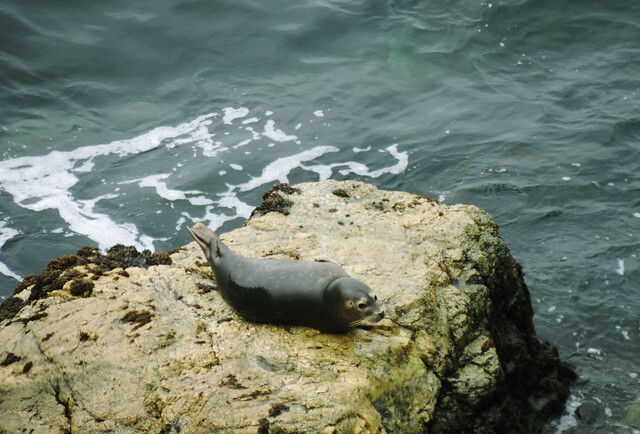 😀 But we’ve seen so many seals, sea lions and even sea otters, whales and killer whales close to the shore while hiking in Point Lobos as nowhere else in California. What about a wildlife watching roadtrip? 17-Mile Drive is a scenic road through Pebble Beach and Pacific Grove on the Monterey Peninsula. There’s several wonderful vista points along the way and the panorama itself was enough to amaze us. But in addition, you have a good chance to spot whales and even if you are not that lucky, tons of seals and sea lions are almost guaranteed. Several companies run whale watching trip starting from Monterey harbour and sailing through the bay to spot whales and dolphins. Of course, seeing whales is not guaranteed, but a boat trip is fun in the first place and you have high chance to see something in the second place. And by that something we mostly mean tons of playful dolphins who will most probably start racing with your boat and put on quite a show. You have good chances to see whales on these tours, too, but that depends on the season and well, you need some luck as well. Just don’t let those huge advertising posters about jumping humpback whales manage your expectations. Whales in general are not so active as dolphins and they don’t go close to the boats (and boats have to keep a certain distance). So it’s still good if you have your binoculars on the trip. We’ve signed up for a trip and we loved it! We went in February which is the migration period of gray whales and we’ve spotted several whales during our 3-hour trip, two of those came relatively close. 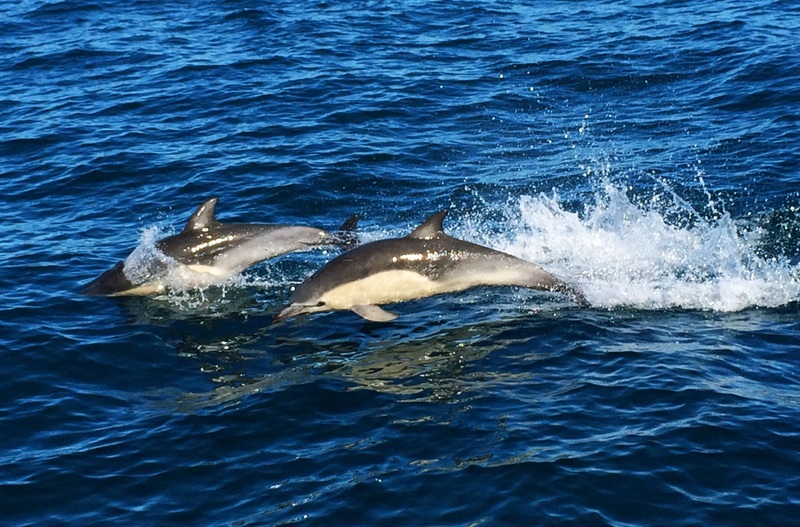 One was playing with the dolphins – or was it only the dolphins who wanted to play? The other was just swimming close by our boat. But we can’t show you those stunning whale pictures from an up close perspective. It’s one thing to see them (and we could see them only for seconds and then waited minutes to see them again) and another to take a good picture. Our photography skills are not at that level yet – and we wanted to see them with our own eyes anyway, so we didn’t even take photos. Are whale watching trips worth it? It depends. For us it was absolutely worth it. 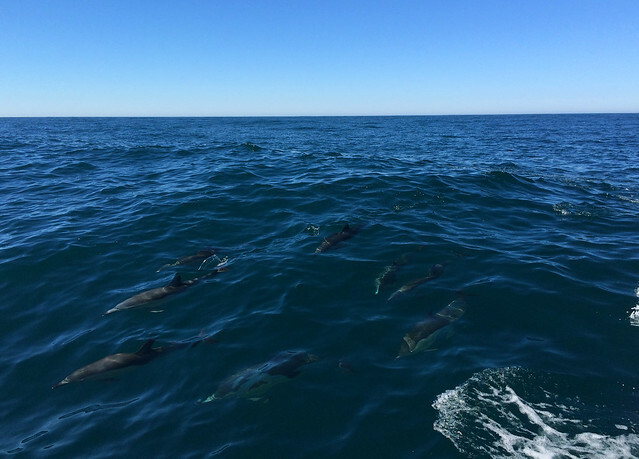 But each tour is a different experience and though you are almost guaranteed to see something, because Monterey Bay is full of seals, dolphins, otters, seabirds and whales, no one guarantees what that something will be on your tour. We think that if you like nice boat trips and don’t go with very high and precise expectations, then you will be happy with your experience. But going on a trip just to see a lot of whales from up close – well, this could turn out to be disappointing. 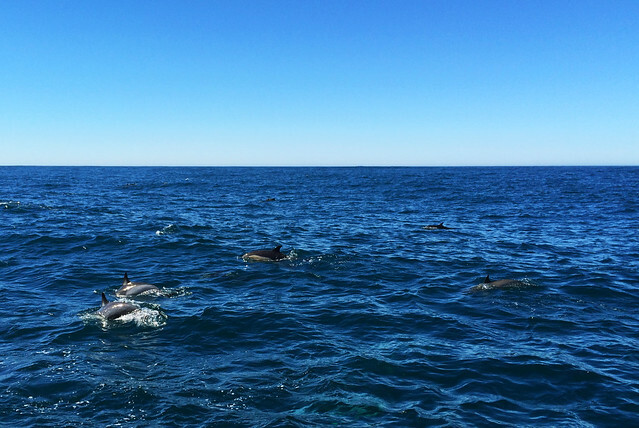 But the good thing is that boat trips are not your only chance to see whales. They really come close to the shore from time to time, so just pay attention while you are driving or hiking on the coast. Basically, year-round. There’s roughly two whale-watching seasons. One is from mid-December to March and it’s the migration period of the gray whales. They migrate each year from their feeding grounds in the cold Arctic sea to the warm lagoons of Baja California, Mexico. From April to mid-December it’s the season for humpback whales, several dolphin species and blue whales. Do you like watching wildlife? Which are your favorite spots? Beautiful! We spent over a week in this area just a few months ago. LOVED it! I live in Sweden and I dream of visiting California during the summer (that might be all year, I’m not sure). There is so much I’d like to see: The architecture, theme parks, LA and much, much more. I’m thinking of renting a car and drive along the coast and see where I land. Great post btw ? Thanks for your comment. 🙂 California coast is so beautiful! And renting a car is a good idea there as distances are long and public transport is basically non-existent. 😀 Wherever we went along the coast it didn’t disappoint. Hope you get there and will have a fabulous time! Saw your blog because me and my wife were researching where to spend our 21st Wedding Anniversary. Sadly Napa is still smoldering and a lot of the smoke is still in the valley and along the coast. We decided on Monterey so we could view the ocean and hopefully see some whales. 21st anniversary, that’s really something! Congrats! 🙂 We hope you’ll enjoy Monterey, we found it so charming, and the ocean wildlife is amazing.